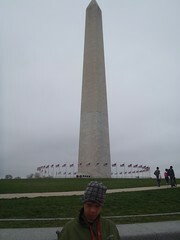 The Washington Monument is currently closed from earthquake damage that occurred back in August 2011. You can still go up pretty close to it, but if you cannot go up it, it is kind of better to just view it from afar. There is a typical sloped path up the hill to it for those that do want to walk or roll up closer. 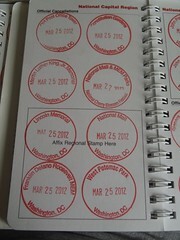 The main purpose for our visit, though, was to get all the National Park Passport stamps they keep at the Washington Monument Bookstore. The Washington Monument Bookstore is located at the bottom of the hill on the east side of the monument (i.e. on 15th Street). The bookstore is very small and barely has just enough room to fit the wheelchair through, but not so much with it being crowded with people. I just left Mik right inside the store. There was still just enough room for others to walk around him while I went over to the stamping station, which is on a high counter that Mik would not have been able to see or use unless he enter with his powerchair in a standing position, but then again he probably would not have been able to manuever through the small store like that anyways. Mik felt claustrophobic having to wait for me, but he did like the warmth of the store. If the weather was nicer, he would have much preferred to stay outside. For most National Park Passport stamping locations even waiting in a tiny store would not have been annoying for Mik, but he had to wait almost 10 minutes for me because there were 24 stamps to get, which means me stamping 48 times (once for each of our books). At least there was not a line when I got to the stamping station, so I got done as quickly as possible, but there was several people waiting to use them by the time I finished. Mik got concerned about where I was and he was stuck with people on all sides and could not go anywhere, but he also liked that we got a bunch of stamps and they are all places we have been to and many we had never got the stamp for before. 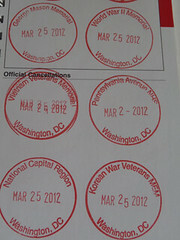 After getting the stamps at the Washington Memorial Bookstore, we only had room for one more stamp in the National Capital Region of our 25th Anniversary Edition National Park Passports. 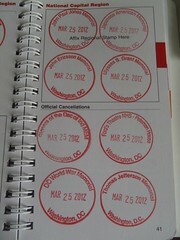 It was a good thing I brought our older regular National Park Passports because now we collected some in the National Capital Region of those instead of putting the extras in the Additional Cancellation pages, which I want to save until we fill a particular region pages in both books.